Yay! I’ve finally started my journey as a murder mystery writer. After years of reading crime fiction, especially that from the Golden Age of Detective Fiction, I’m overjoyed to be now writing my own series. I’m celebrating my new venture with a new name: Brigid George. This pen name is a tribute to my father, George Rowley, who always called me Brigid. Although I say I’ve just started my journey, it really started over forty years ago when I began reading mystery authors such as Sir Arthur Conan Doyle, Agatha Christie, Dorothy L Sayers, Josephine Tey and Ngaio Marsh. Thousands of hours of reading these and other crime fiction writers have prepared me for writing in the genre. Readers of Whisper My Secret might suggest that this journey started even earlier with the mysterious secret that lurked in our family. Whatever the starting point, I love writing murder mysteries as much as I love reading them. I chose to write the type of book I most like to read: a ‘cosy’ whodunit. When I’m in bed, such stories are perfect. The fascination of the puzzle holds me spellbound until I arrive at sleep land in what seems like no time at all. When the violence and horror in the daily news broadcasts create in me a desperate desire to know that order can be restored to our world, it’s a whodunit I reach for. 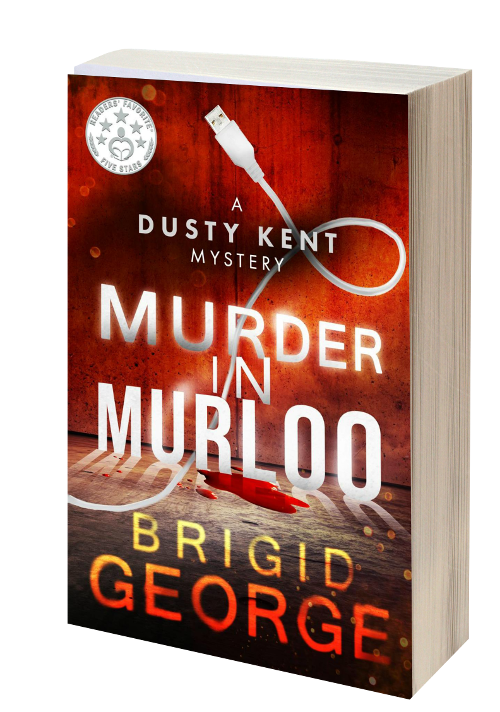 Murder in Murloo, the first book in my mystery series, is a whodunit set in a small Australian fishing village overlooking the Southern Ocean. The village is a fictional place but is inspired by Marlo in East Gippsland where I grew up. The series features Dusty Kent, a feisty petite redhead with a black belt in karate and a passion for flushing out murderers. Accompanied by her ‘Watson’, a travelling Irishman by the name of Sean O’Kelly, Dusty is determined to uncover the ‘miserable murderous maggot’ who callously terminated the life of a young woman. A crucial element in my development as a writer has been the role of Amazon in providing unprecedented publishing opportunities. Writers can only grow if their work is widely read. Feedback from readers by way of letters, emails, blogs, social media and reviews, motivate writers and help them to improve their skills. My sincere thanks to those who read my books and those who write reviews. Readers are invaluable. Reader reviews are extremely helpful. Be the first to know about the next Brigid George release and special offers. Sign up here for email notification. Having read this I thought iit was really enlightening. together. I once aagain find myself spending way too much time both reading and posting comments. But so what, it was still worrth it!